Walking distance to Port Carling yet completely private, this gorgeous six bedroom three and a half bath cottage is the perfect spot for your family to escape the city! Elegantly decorated with a large dreamy kitchen perfect for hosting family and friends. Located on 4.4 acres of beautifully landscaped grounds with trees for privacy yet sun all day at the boathouse. At the shoreline you will find a therapy hot tub and gentle granite steps into the water plus a sand beach for the wee ones. 14' Deep water off the dock for boating and swimming. 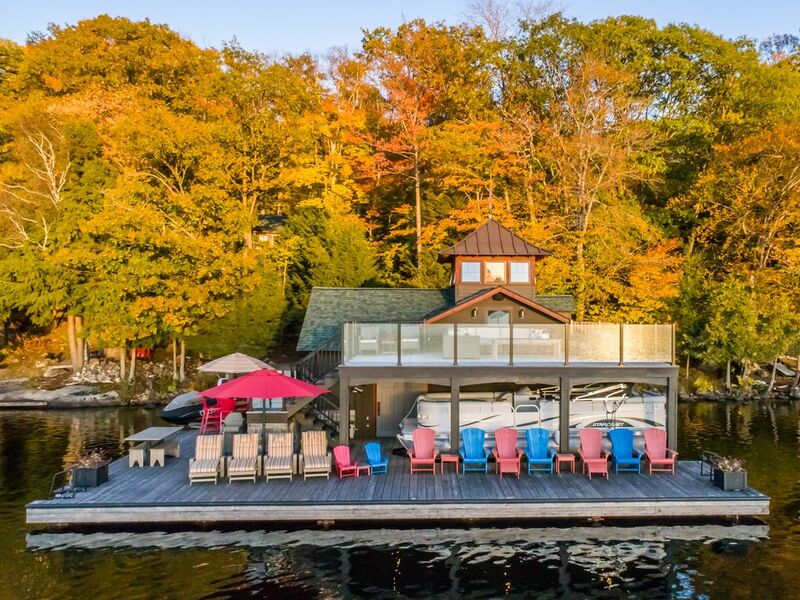 There is an outdoor stone firepit with seating for everyone, a bar area and washroom in the boathouse plus a to die for upper boathouse deck where you can toast the day while you watch the perfect Muskoka Sunset! The cottage comes with 2 kayaks, 2 canoes, and a paddle boat as well as a lily pad and 2 SUP boards. There is a massive outdoor stone firepit by the lakes edge plus many lovely spots to gather and enjoy the outdoors including while sitting in the lakeside hydro massage hot tub. There is a large dock with a lower level seating area as well as the upper deck for sun all day and full sunset views. The dock can accommodate 2 boats ~ a 27foot & a 16 foot. You can rent the pontoon boat seen in the photos as well as many other boat rental options through our Private Fleet© boat rental service. Inside the cottage each bedroom has a smart TV's plus there are DVD players in most. The incredibly well equipped chef's kitchen has a water cooler, a wine fridge, several different coffee options including a Keurig and a Nespresso machine, and an ice machine that makes up to 50 lbs of ice a day! There are three large fridges: one in the kitchen, one in the boathouse, plus an extra full fridge in the work room for overflow. Steam showers and heated floors, a play station in the lower level entertainment room plus Nuvo stereo system you can hook your own music system up to. There is also a mosquito ban system to keep the bugs at bay. Meticulously maintained and ready for your family, Muskoka Wonderland has it all! Getting all of our family (daughters, sons-in-law and grandkids) together is always a special occasion, but enjoying it at Muskoka Wonderland was even more special. The cottage is spectacular, beautifully appointed, extremely well equipped (especially for our Thanksgiving dinner) and the view from the boathouse balcony was appreciated by all. A very quick swim in the lake at this time of year was made possible by having the hot tub close to the lake and available both before and after the cold water dip. Overall a great experience. Port Carling is the hub of the big three lakes and a fabulous town filled with restaurants, art galleries and quaint shops.